On Wednesday November 5th from 10am-12pm come and find out about Collaborate! 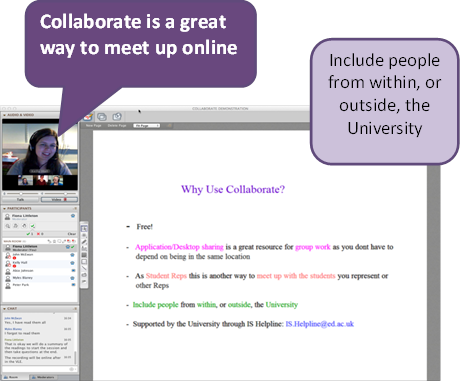 Collaborate is the University Supported Virtual Classroom and/or Meeting tool and as students you can access Collaborate via the MyEd Portal. Once you have set up the meeting you can invite people from within, or outside, the University, you just need their email address. Collaborate is a great resource for study groups or other kinds of group work as you don’t have to be in the same location. There are many different tools within Collaborate to make your group work as successful as it would be if you met up in person. We will be having a LIVE! Collaborate Session during the Pop Up Library…come join in and see what Collaborate is all about! All you need to get started is a computer (or mobile device) and internet connection! This entry was posted in Pop-up Library and tagged chat, Collaborate, group work, hangouts, online, pop up library, study groups, virtual classroom, virtual meeting, web conference tool by khall. Bookmark the permalink.